“Belgium does not have an official position on Kurdistan independence as of yet” said Ambassador, Mr Hendrik Van de Velde of the Kingdom of Belgium during his visit to the Middle East Research Institute on 12 June 2017. 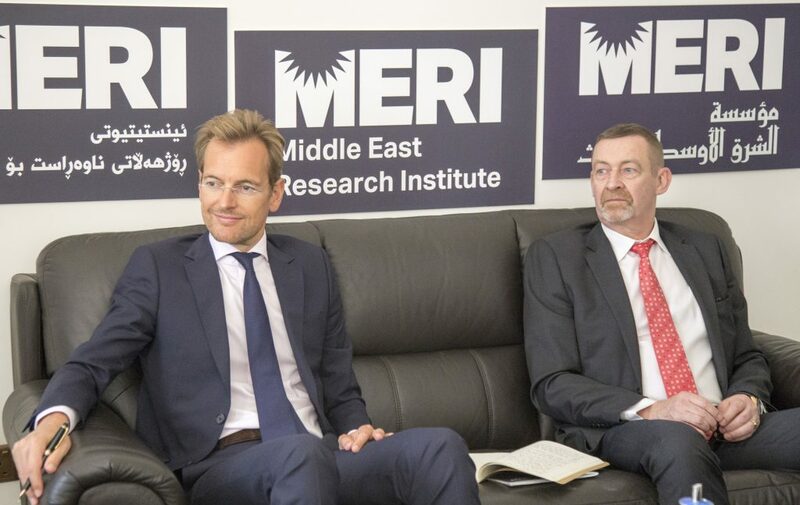 The Ambassador was accompanied Consul, Mr Patrick Eeckhout, and visited the Middle East Research Institute (MERI) to discuss post-Islamic State (IS) Mosul and the current political situation in the KRI given the upcoming independence referendum. The meeting began with a discussion of the referendum and its consequences for stability across Iraq. The delegation was keen to gain an understanding of how the referendum will influence politics in the country and the region. Although if the referendum goes ahead the result is expected to be in favour of independence, it was reflected whether the consequences that this will entail will be positive or negative for the relationship between Baghdad and Erbil. Prof. Dlawer Ala’Aldeen, President of MERI, noted that “we are in the Middle East, the situation can turn negative or positive quickly, particularly if the main stakeholders in Baghdad and Erbil failed to negotiate constructively”. It was agreed that, as the referendum is not binding, the situation should not escalate, instead it should lead to more direct, frank and heart-to-heart discussions about the long-term future. The referendum could be used to lobby for more power in a way that improves relations between the two parties. Although Belgium does not currently have an official position on KRI independence, they generally follow the line of the EU. It was stressed that the EU should not simply focus on the territorial integrity of Iraq, but also the integrity of the people. Therefore, it was argued that the EU should make its support to the Iraq and KRI conditional in order to encourage internal reform. The degree of EU involvement in Iraq following the Mosul operation was also subject to discussion. Although the EU may seek to become less involved, it was emphasised that defeating Islamic State is not the only condition for achieving stability in Iraq. Nineveh continues to be divided between the influence of different groups and minorities and there is not currently a consensus on how it will be governed post-IS. Therefore, it should not be assumed that IS’ military defeat will be sufficient to ensure peace and thus there will likely be a need for the EU to continue their involvement beyond the military operation’s completion. In order to stabilise Nineveh after Mosul’s liberation it will be necessary not only to ensure that reconstruction takes place, but also reconciliation between the different communities. Finally, the role the PMF (Hashd al-Shaabi) will play post-IS was discussed. It was argued that although the PMF have been integral in the fight against Islamic State, their continued presence in Iraq has the potential to undermine the state-building process through providing competing subnationalisms. Informed by the MERI Hashd al-Shaabi report, it was suggested that the PMF is not one united body but is instead made up of different militias with their own goals and objectives which may run counter to Iraqi unity. Belgium’s role in Iraq is mainly security driven and their engagement is currently militarily oriented. The embassy is based in Amman, Jordan although there are regular missions to Iraq and elsewhere in the region.